When it came to working with the architect to design our new home, one thing we were sure about was a good living space upstairs. This meant an upstairs reception area and an ensuite attached to our bedroom. We know this is a place we will be spending so much time, so we wanted to get it right. The ensuite plays such a key part of this and was one of the first things we looked at. 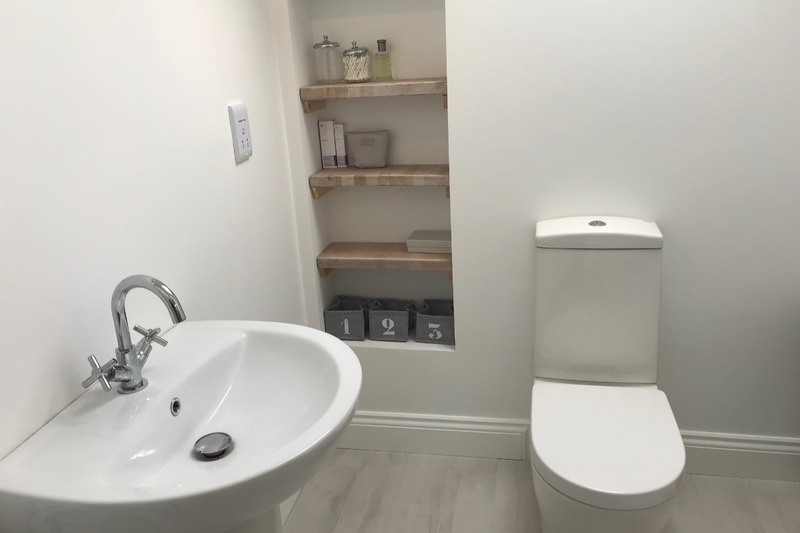 When it came to fitting out the ensuite, we had a very specific look and feel in mind, so today we want to sure some tips for designing an ensuite. Whether you’re designing a home from scratch or looking to add an ensuite to your existing bedroom, the most important thing to consider is the space that you have. While an ensuite doesn’t need the same space as a main bathroom, it’s somewhere you will likely be first thing in the morning and last thing at night, so you won’t want to feel cramped. Work out what all you want in your ensuite and whether you want a bath or shower (or both). Once you have worked this out, measure the size of space you will need and get an idea of the space you will have to move about, and also how much of your footprint it is going to take up – you won’t want it eating into your bedroom space. An ensuite can be a big part of any home, so don’t rush into making a decision on it. Take your time and understand what exactly you want and need. From here, you can work your measurements to suit. When it comes to adding an ensuite, take time to research your trades. We were very lucky in that our main contractor was able to sort most of this for us and got some excellent tradesmen in. If you’re not in this position, take time to do your research and get the right people for the job. Ask questions and get recommendations and don’t be afraid to ask for photos of previous jobs. For our ensuite we needed a builder to do the main structure, joiners to do the stud walls and doors, plumber to do all the plumbing work, electrician to connect the lights and fans, and tilers for the floors and walls. That’s a lot of tradesmen for a small space, so be prepared to invest and also ensure you have the right people working one your ensuite at the right time. 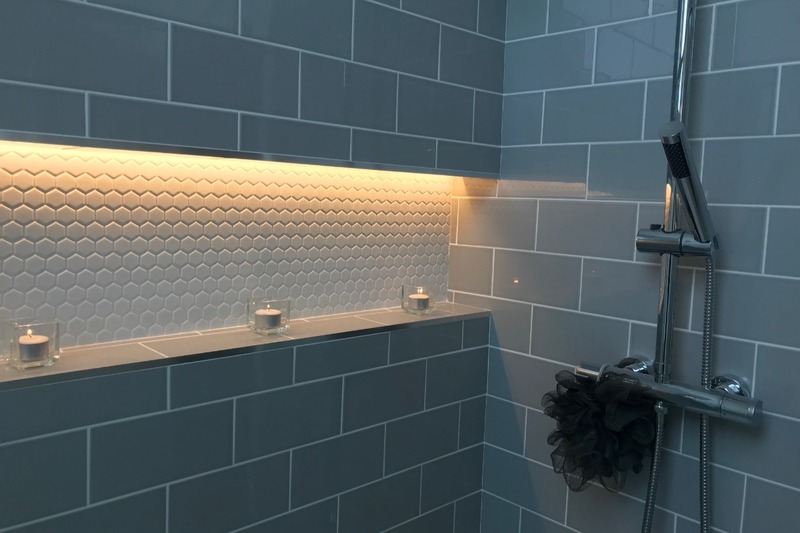 If you are planning on adding an ensuite to your home, or are considering your own self-build project and have any queries around finding suitable tradesmen, just drop us an email and we’ll be all too happy to provide advice. When it comes to picking your fixtures and fittings, websites like Pinterest, Ideal Home and Houzz can be great for getting some inspiration. Even a quick search on Google Images can help you get an idea for what you like and what you don’t like. When you know the style you want, websites like tapwarehouse.com and Victoria Plum have a great range of fixtures and fittings. We ordered almost all of our bathroom and ensuite fixtures from these sites, and with great returns policies, there really is very little risk. 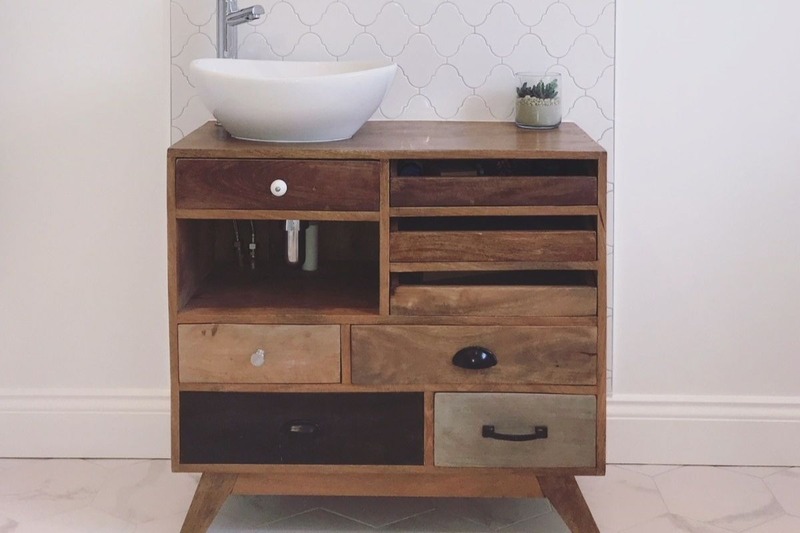 We opted for free-standing furniture for our downstairs bathroom but wall-mounted furniture and fittings can be great for an ensuite, particularly when space is of a premium. If you want to try to make your ensuite feel slightly bigger, it’s worth adding a large mirror. Mirrors reflect light and can really help make a smaller space like an ensuite feel much bigger than they actually are. Compliment this with light, neutral paint to help give the illusion of a bigger space. Large mirror’s can also make a great statement piece in a bathroom, especially an ensuite. 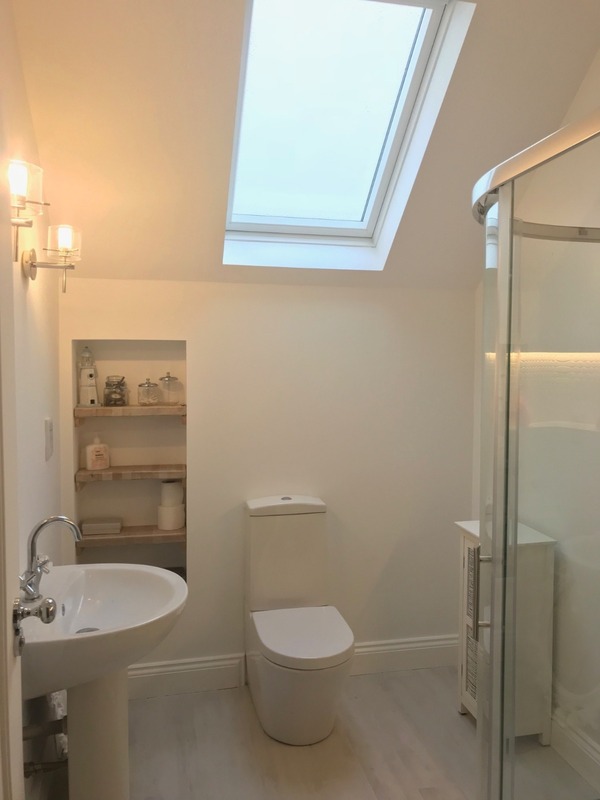 If you are really limited in the space department, going for a wet room could be the answer you’re looking for. Rather than installing a shower cubical or bathroom, you just need to separate one corner of the ensuite with a glass screen and then hang the shower head inside it. As we weren’t pushed for space we decided against the wet room, although we had given the idea plenty of thought. With space limited in many ensuites, it’s important to consider where and how you are going to store your bathroom essentials. 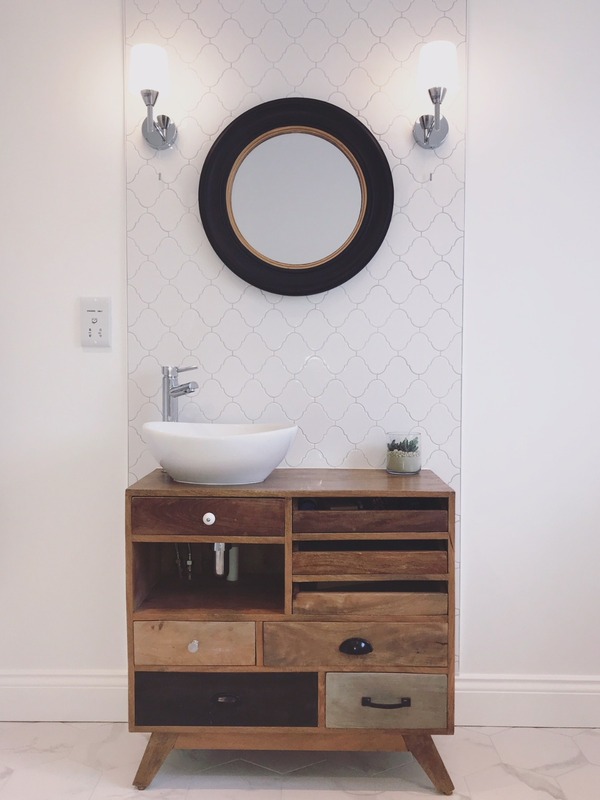 Cabinets are a great way to store your bathing essentials, but if you are adding an ensuite or building from scratch and adding a stud wall, consider leaving an inset area in your shower to use for shampoos and shower gels. Not only is this practical, but it can also look really nice, especially if complimented with nice lighting, as we have done in our own. As you can see then, when it comes to adding an ensuite to your bedroom, there is plenty to consider. Don’t rush things. Take the time to get the layout you are happy with and the design you want. You’re the one who will be using it on a daily basis, so be sure to end up with an ensuite you’re happy with and not just something that is functional. Have you any ideas for designing an ensuite based on previous experience? Share your tips with us in the comments section below. When Should You Replace Old Furniture?